BioZyme® Inc., manufacturers of natural supplements for a variety of livestock, is excited to welcome Salem Veterinary Service into its’ dealer network. Salem Veterinary Service will carry a complete line of BioZyme VitaFerm®, Sure Champ® and Vita Charge® branded products at its office at 702 S. Oliver St. in Salem, SD. The VitaFerm brand offers highly bioavailable vitamin, mineral, trace mineral and protein supplements with the Amaferm® advantage, BioZyme’s proprietary prebiotic, for the cow-calf producer. With regular use, VitaFerm provides increased forage utilization, improved conception rates and performance that pays. 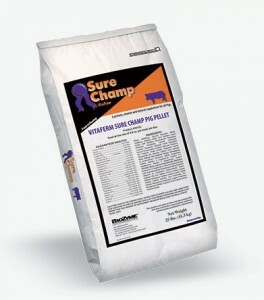 Product lines include Concept∙Aid®, HEAT™, Cattleman’s Blend™, Sure Start® and Cow-Calf Mineral. Formulated specifically for cattle, goats, pigs and sheep in the show ring, Sure Champ is a top-dress supplement that contains the Amaferm advantage and is research-proven to increase water and feed intake. When used as a proactive approach to digestive health, Sure Champ improves the integrity of the gut, appetite and overall performance as well as enhancing skin, hair quality and bloom for that show-ready look. Vita Charge is a multi-species livestock supplement that provides a powerful dose of vitamins, B vitamins and the Amaferm advantage formulated to protect and promote the recovery of livestock during times of high stress. Vita Charge is available in many forms, making its application easy. For more information on any of the BioZyme product lines, visit www.biozymeinc.com or contact Salem Veterinary Service at (605) 425-2020.